The spacious 2017 Ford Expedition is the company’s largest sports utility vehicle which offers class-leading maximum cargo space in the extended-length version. 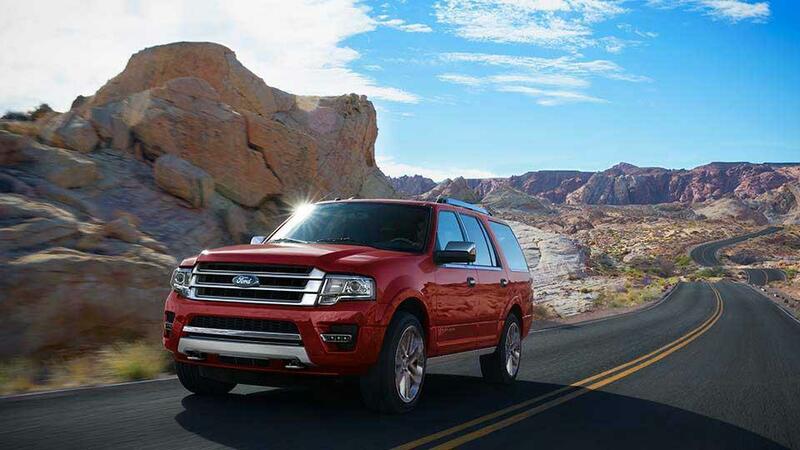 The Expedition is the clear leader among full-size SUVs when comparing capabilities. And there’s a new technology update for the 2017 model year. The Ford Expedition is available in two different lengths. The longer 131-inch-wheelbase version is fitted with three rows of seats and features 3,703 litres (130.8 cubic feet) of maximum cargo space to provide customers with a truly useful full-size utility vehicle. The standard version sits on a still-considerable 119-inch wheelbase, a little more than six inches longer than the Ford Explorer. The 119-inch wheelbase version of the 2017 Ford Expedition features three rows of seats and up to 3066 litres (108.3 cubic feet) of cargo space. Both versions provide standard seating for up to eight. There’s also a seven-passenger configuration available with individual second-row bucket seats. When more cargo space is needed, the third-row bench seat can be folded down for a flat load floor. The second-row split bench seats also fold flat to the floor for maximum cargo space. The 2017 Ford Expedition continues to feature an independent rear suspension which provides both a comfortable ride and exceptional handling. Unlike a solid rear axle found in many SUVs, the independent rear suspension provides room for the one-touch PowerFold fold-flat third row bench seat and the low floor height which makes for easy loading. The suspension is further refined by the available Continuously Controlled Damping system, now standard on Platinum models. It provides the driver with the option to select from one of three suspension modes: Comfort, Normal and Sport. Sensors detect 46 unique road condition, steering feedback, and braking inputs and adjust damping in a fraction of a second. All of which is designed to provide passengers with a smooth, comfortable ride. An Innovative Electric Power-Assisted Steering (EPAS) system, specially tuned for Expedition, gives drivers improved manoeuvrability while an easy, fluid feel at low speeds and a firmer road feel at high speeds – helping save fuel by operating more efficiently than traditional, making for a more engaging drive. The 2017 Ford Expedition is powered by the 3.5 L EcoBoost V6 engine, the same power plant as is available in Canada’s favourite pickup truck, the Ford F-150. The 3.5 L EcoBoost V6 features direct fuel injection and twin turbochargers. The 3.5 V6 EcoBoost generates 365 horsepower and 420 lb-ft of torque, giving the 2017 Ford Expedition a maximum 4,173 kg (9,200 lb.) towing capacity when equipped with the Heavy-Duty Trailer Tow Package. All 2017 Expeditions are equipped with Ford’s six-speed SelectShift automatic transmission, the driver can also select a manual mode that allows drivers to use a shift-mounted rocker switch to select the desired gear. The available SYNC 3 is Ford’s easy-to-use, responsive voice-activated technology. SYNC 3 responds quickly to your conversational voice commands and offers a smartphone-like capacitive touchscreen with swipe capabilities. You’ll also find a sleek user-friendly interface to help you connect to and control your smartphone. Navigation software is an option with easy destination entry and pinch-to-zoom functionality with automatic updates over Wi-Fi. And you can plug your smartphone into the available 390-watt Audio System from Sony that features 12 Sony speakers distributed around the cabin, including a subwoofer behind the 2nd-row seats. The available Forward and standard Reverse Sensing System uses ultrasonic sensors in the bumpers to audibly alert you to certain objects when you’re moving forward or backing up at slow speeds. Put the gear selector in Reverse and the rear view camera transmits video of what’s behind your vehicle as you’re backing up. The live image is displayed on the standard 4.2-inch centre display, or on the available eight-inch touch SYNC 3 screen. With the available Keyless Entry with Push-Button Start with the key fob in your pocket, you need only press the brake pedal and push the start-stop button to start the engine. Available Blind Spot Information System alerts you to another vehicle driving in a blind spot with a warning light in the appropriate sideview mirror. The Cross-Traffic Alert feature can warn you to a vehicle crossing behind you when you’re backing out of a parking spot from up to 13.7 metres (15 yards) away. As hard as it may seem to believe, we’ve just scratched the surface of the capabilities, features, and options available on the 2017 Ford Expedition. To get the complete story, come by Van Isle Ford in Port Alberni, BC.